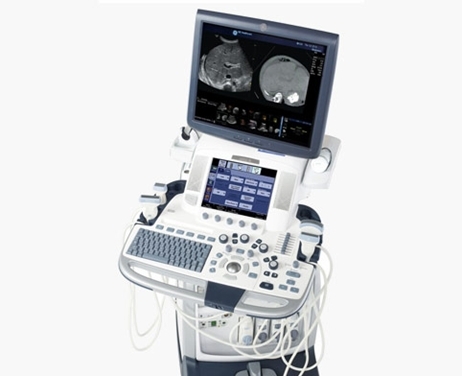 The GE Logiq e9 ultrasound represents the culmination of GE’s best imaging, workflow, and ergonomics technologies and capabilities. This point-of-care ultrasound can help deliver extraordinary image quality on a broad spectrum of patient body types, and this ultrasound is widely praised for its ability to aid in blood flow visualization, workflow enhancement, and visual tracking while giving an exam.The Logiq e9 ultrasound is designed for radiology and vascular applications, as well as OB/GYN, abdominal, small parts, urology, and many others. In fact, versatility is one of this ultrasound’s most revered aspects. Through proper usage, physicians can increase accuracy and real-time diagnosis confidence due to the Logiq e9 ultrasound’s high spatial and contrast resolution. With innovative and lightweight transducers, physicians can expect efficiency, performance, and ergonomic comfort. Another key feature of the Logiq e9 is its Scan Assistant, which allows physicians to pre-program common settings and let the ultrasound do the detailed manipulations while the patient is scanned. While there are fantastic imaging enhancements on the GE Logiq e9, a lot of time went into ergonomics, efficiency and ease-of-use. Over time, GE has developed and improved upon its Scan Assistant. This is a bit of an underrated feature. It will autosteer color Doppler and set up imaging controls and modes, initiates and autocompletes measurements based on the study you’re performing, automatically sets up imaging modes and controls based on the measurement, and automatically inserts annotations on the image. These seemingly minor additions greatly improve a sonographer’s workflow… few adjustments, no typing, and no selecting measurements.